Hard edge, hard light...hard ride? The rich color and curve of the seatbelt really stands out. 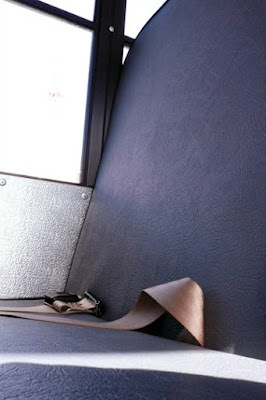 I'VE SAT IN THAT VERY UNCOMFORTABLE BUS SEAT FAR TOO MANY TIMES. I once rode the bus from New Jersey to Vermont with a troupe of Girl Scouts who sang songs all the way. I thought I was going to lose my mind.